The new work shows the immune system can be prompted to mimic and accelerate a rare natural process during which antibodies slowly evolve to become better and better at targeting the constantly mutating HIV virus. Shown here is the molecule eOD-GT8 60mer, used in the team’s reductionist strategy. A series of new studies led by scientists at The Scripps Research Institute (TSRI) and the International AIDS Vaccine Initiative (IAVI) describe a potential vaccination strategy to jump-start the selection and evolution of broadly effective antibodies to prevent HIV infection. The researchers plan to test this strategy in an upcoming human clinical trial. The new studies, published September 8, 2016, in the journals Cell and Science, showed the immune system can be prompted to mimic and accelerate a rare natural process during which antibodies slowly evolve to become better and better at targeting the constantly mutating HIV virus. “Although we still have a long way to go, we’re making really good progress toward a human vaccine,” said William Schief, professor at TSRI and director of vaccine design for IAVI’s Neutralizing Antibody Center (NAC) at TSRI, whose lab developed many of the vaccine proteins tested in these studies. Schief co-led several of the new studies with TSRI Professor David Nemazee; Dennis Burton, James & Jessie Minor chair of the TSRI Department of Immunology and Microbial Science and scientific director of the IAVI NAC and the National Institutes of Health (NIH) Center for HIV/AIDS Vaccine Immunology and Immunogen Discovery (CHAVI-ID); and Ian Wilson, Hansen Professor of Structural Biology and chair of the Department of Integrative Structural and Computational Biology at TSRI. A vaccine needs to elicit those rare antibodies, called “broadly neutralizing antibodies” (bnAbs), which fight a wide variety of strains of HIV—and it needs to elicit them quickly. One strategy to accomplish this, which scientists at TSRI have dubbed the “reductionist” strategy, is to find which antibody mutations are most important for making them effective against HIV, then to “prime” the immune system to start making antibody precursors. From there, scientists hope to prompt one important mutation after another with a series of different “booster” shots, deliberately building up a bnAb one step at a time. In a recent study in the journal PLOS Pathogens, the scientists created 3D maps of a structure on HIV known as the CD4 binding site. If antibodies successfully attack this site, scientists believe, most strains of HIV could be crippled. The researchers also created high-resolution maps of bnAbs that could bind to the CD4 binding site. “This is one of the most complete blueprints we’ve had for this target,” said Jean-Philippe Julien, a research associate in Wilson’s lab at the time of the study, who served as co-first author of the study with TSRI Research Associate Joseph Jardine, IAVI Research Scientist Devin Sok and Bryan Briney, assistant professor of immunology at TSRI. The scientists then studied stripped-down versions of the bnAbs to see exactly which components were important in targeting the CD4 binding site. With the results from the PLOS Pathogens study, the researchers finally had a guide to which mutations were the most important. They also had a better idea of which antibody-eliciting molecules, called immunogens, could be given in booster shots to trigger the right mutations at the right time. “We’re figuring how to boost antibodies to the next step—how to keep walking them along the path to increased breadth and potency after we get them started with a priming shot,” said Jardine. This finding set the stage for the three new studies. For the first one, published in Cell, researchers tested a priming immunogen, followed by a series of booster immunogens from the Schief lab. The immunogens were tested in a mouse model, developed by the Nemazee lab, which was engineered to have the genes (the raw materials) to make antibodies with the right mutations to target the CD4 binding site. The team found that the elicited antibodies more closely resembled mature antibodies. The sequence of immunogens had done their job. In the second Cell study, led by John R. Mascola at the NIH’s National Institute of Allergy and Infectious Disease (NIAID) Vaccine Research Center and Frederick W. Alt, a Howard Hughes Medical Institute (HHMI) researcher at Boston Children’s Hospital and Harvard Medical School, along with TSRI co-authors, took the reductionist approach a step further, showing that it could induce antibodies in mouse models with immune systems that can create an even wider range of antibodies—more similar to the human immune system. Results from the Science study further supported the reductionist vaccine approach. For the study, the researchers took on an even bigger challenge—to “prime” antibodies in a mouse model with a human-like immune system developed by Kymab Ltd, a UK-based company. The Kymab mouse model’s more complicated immune system made it more difficult for a vaccine protein to find and activate the “precursor” cells that have potential to produce bnAbs against the CD4 binding site. In fact, the researchers estimated that each Kymab mouse contained only one such precursor cell on average—with some mice containing none—among approximately 75 million antibody-producing cells. Despite this “needle-in-a-haystack” challenge, scientists found that their vaccine priming protein activated the appropriate antibody precursors in one-third to one-half of mice tested, suggesting this feat would also be possible in humans, where the targeted precursor cells are more plentiful. “This seems to be a much higher bar than we will face in humans,” Schief said. “The reductionist vaccine approach we’re undertaking will hopefully not only lead to an HIV vaccine, but also could potentially be applied to other challenging vaccine targets,” said Sok, who served as co-first author of the Science study with Briney, Jardine and Kulp. The researchers also gave credit to their strong international collaboration. “Our phenomenal results with the team at The Scripps Research Institute came from work at the interfaces—and boundaries—of vaccine technology, immunology, protein engineering and structural biology,” said Professor Allan Bradley, chief technical officer at Kymab and director emeritus of the Wellcome Trust Sanger Institute. IAVI and partners are planning for a clinical trial for next year to further develop and test whether the reductionist vaccine strategy—starting with activating the right precursors—will work in humans. If successful, the next step will be to test their booster immunogens. The first Cell study, Tailored Immunogens Direct Affinity Maturation Toward HIV Neutralizing Antibodies, included additional authors from the Ragon Institute. The study was supported by the IAVI through the NAC (grant SFP1849); NIAID grants; CHAVI-ID (grants UM1AI100663, P01AI081625 and R01AI073148); the Ragon Institute; and the Helen Hay Whitney Foundation. 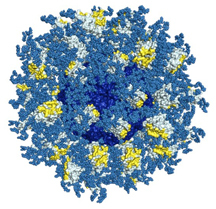 The second Cell study, Induction of HIV Neutralizing Antibody Lineages in Mice with Diverse Precursor Repertoires, included additional authors from HHMI; Boston Children’s Hospital; Harvard Medical School; the NIH’s NIAID Vaccine Research Center; Vanderbilt University; Columbia University; the Ragon Institute; Fred Hutchinson Cancer Center and the Duke University School of Medicine. This work was supported by the NIH (grants R01AI077595, AI020047, P01 AI094419, U19AI109632, P01-AI104722; CHAVI-ID (grants 5UM1 AI100645 and 1UM1 AI100663); the intramural research program of the NIAID Vaccine Research Center; the IAVI NAC Center; Collaboration for AIDS Vaccine Discovery funding for the IAVI NAC Center; the Ragon Institute and an HHMI Medical Student Fellowship. The Science study, Priming HIV-1 Broadly Neutralizing Antibody Precursors in Human Ig Loci Transgenic Mice, included additional authors from Kymab Ltd, the Wellcome Trust Sanger Institute and the Ragon Institute. The study was supported by IAVI, with the generous support of the United States Agency for International Development (USAID); Ministry of Foreign Affairs of the Netherlands; the Bill & Melinda Gates Foundation; the Ragon Institute; the Helen Hay Whitney Foundation; and NIAID (grants P01 AI094419 and CHAVI-ID 1UM1AI100663). See also additional Cell and Immunity studies on HIV/AIDS vaccine work led by TSRI scientists and published on September 8. YOU CAN HELP IN THE FIGHT AGAINST HIV/AIDS FROM THE COMFORT OF YOUR EASY CHAIR. WCG runs on your home computer or tablet on software from Berkeley Open Infrastructure for Network Computing [BOINC]. Many other scientific projects run on BOINC software.Visit WCG or BOINC, download and install the software, then at WCG attach to the FAAH@home Phase II project. You will be joining tens of thousands of other “crunchers” processing computational data and saving the scientists literally thousands of hours of work at no real cost to you. The Scripps Research Institute (TSRI), one of the world’s largest, private, non-profit research organizations, stands at the forefront of basic biomedical science, a vital segment of medical research that seeks to comprehend the most fundamental processes of life. Over the last decades, the institute has established a lengthy track record of major contributions to the betterment of health and the human condition. The institute — which is located on campuses in La Jolla, California, and Jupiter, Florida — has become internationally recognized for its research into immunology, molecular and cellular biology, chemistry, neurosciences, autoimmune diseases, cardiovascular diseases, virology, and synthetic vaccine development. Particularly significant is the institute’s study of the basic structure and design of biological molecules; in this arena TSRI is among a handful of the world’s leading centers. The institute’s educational programs are also first rate. TSRI’s Graduate Program is consistently ranked among the best in the nation in its fields of biology and chemistry.